When you buy local you invest your food dollar close to home, strengthen your community, and benefit from eating fresh healthy food. And by cutting down on the fossil fuel required to bring your food to market, you reduce carbon emissions and help to preserve the environment. To find out how to buy locally in the Catskills, visit our sections on CSAs (Community Supported Agriculture) and Catskill Farmer's Markets. Most importantly, local farms and food production businesses help create and sustain jobs within their communities, and generate a positive secondary economic impact locally. Supporting small local farms and businesses also helps to preserve a distinctive local character and integrity, and protect valuable land from more invasive development options and the influx of larger, more generic chain business integration. Aspects of our current national food system – including production, transportation, processing and packaging – require considerable fossil fuel and energy use, which puts enormous stress on our environment. Buying locally cuts down significantly on many of these practices, greatly mitigating their environmental impacts. Sustainable farming practices, on the other hand, are not only less environmentally invasive, but can actually be beneficial to local environments. 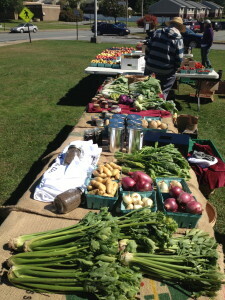 Supporting your local farms and businesses helps to keep money in the local economy. Local purchasing creates a positive economic ripple effect in communities as local producers and businesses spend a larger percent of their earned money in other area businesses. This supports a trend of keeping money circulating within a specific community, as opposed to transferring it out to larger national or chain corporations. Increased local demand for locally grown and processed foods raises farmers and producers profit margins, by reducing transportation and distribution costs associated with more geographically distant sales. The local sale and distribution of food also allows farmers to develop relationships within their communities, both with individual customers and local restaurants and other businesses. Every farm tells a story. Knowing your farmer traces an arc from the soil to your table. When you give your money to a local farmer, you know that money goes to the local economy. When you buy local, you are acquiring food products that are typically fresher, healthier, and more delicious than foods that are transported from further away. The shorter the time between the farm and your table, the less likely it is that nutrients will be lost from fresh food. Additionally, there's a unique kind of assurance that comes from looking a farmer in the eye at farmers market or driving by the fields where your food comes from. Local farmers aren`t anonymous and they take their responsibility to the consumer seriously. Click here for a guide to harvest times and availability of New York State produce.